The Conversion Drive Caster® minimizes the risk of overexertion when moving and maneuvering industrial carts and racks. Carts that required multiple operators to move, can now be handled by one person, resulting in increased efficiency and reduced risk of injury. The battery is easily accessible for quick swap, ensuring continuous operation, even with multiple shifts. 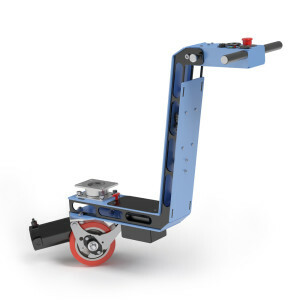 Simply replace a swivel caster with the Conversion Drive Caster and you’ve got the power to move 5,000lbs, you can double the pushing power by adding a stand alone Drive Caster®. For situations that require complex maneuvering, a 2nd Conversion Drive Caster® can be added in place of the other swivel caster, allowing for advanced maneuvering. This unit is available with various top plate sizes and bolt hole patterns. The Conversion Drive Caster is designed to operate at walking speeds (speeds vary by surface conditions, weight loads, slope of surface and other external factors).